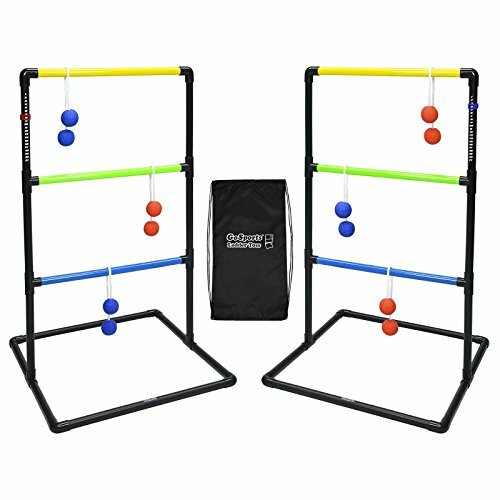 The GoSports Ladder Toss Game is made from sturdy high-gloss PVC to make it one of the best Ladder Toss sets available. This set includes 6 rubber bolos which are great for indoor or outdoor use and younger players. The Bolos are also connected using thick rope to limit tangles unlike other cheap bolo's thin rope that quickly turn into a tangled nightmare. We also glue the connectors onto the PVC pipe so the game comes in as few pieces as possible, making setup lightning quick. Again, compare this to our competitor's economy sets that arrive with a bag full of countless parts and vague assembly directions that turn fun into frustration. The game also includes built in score trackers so you can easily keep score and focus on having fun. The set can be conveniently stored in the included backpack style carrying case. If you are looking for a higher-end Ladder Toss that is made without compromise, you can buy the Go Sports Premium Ladder Toss Game, but if you are looking to have some casual fun at a great price, this is the set for you. That said, this GoSports standard set is built well beyond the quality of any other economy ladder toss set.